Constantly Updated with New Posts…Come Back Often! The coverage was swift. It started prior to the conference, continued during the conference with a record number of live-Tweets (and I wasn’t even live-Tweeting this year, so I can’t take any credit! ), and continues post-conference. Notes are being reviewed, lessons are being considered, speakers’ words are continuing to inspire, and legal marketers are beginning to discuss implementation, improvement and change within their firms. I am in the midst of writing and collecting blog posts, videos, audio and other content from the conference to make it easier to review in one space. If you see, write or produce something I haven’t found, please let me know so I can add it to this list. Tweet me at @NancyMyrland, or email me at [email protected] I’ll just keep adding to this same post so you don’t have to search all over the place. Deal? Deal! 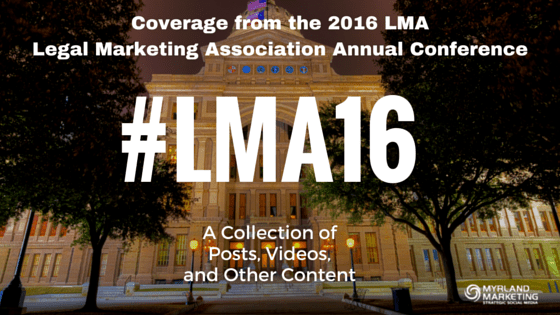 Here We Go…The Collective Brilliance of #LMA16! The Digital Handshake LMA16: ROI (Measuring So You Can Better Manage) … and PechaKucha (LMA Member Login Required) by Roy Sexton, Senior Vice President of Corporate Affairs, Trott Law, P.C. #LMA16 – Keeping Austin Weird … and Making Legal Marketing GREAT (Again) by Roy Sexton, Senior Vice President of Corporate Affairs, Trott Law, P.C. The #LMA16Selfie Campaign, Sponsored by the LMA Social Media SIG! Again, please let me know if you have any posts, videos, or podcasts you would like me to add. I can’t embed all of the presentation slidedecks here as there are dozens, but they can be found on the conference website. All who attended the conference received an email with the link and the password. Nancy Myrland is a Marketing, Content, Social & Digital Media Speaker, Trainer & Advisor, helping lawyers, law firms and legal marketers grow by strategically integrating all marketing disciplines. She is a frequent LinkedIn, Twitter and Facebook trainer, as well as a content marketing specialist. She helps lawyers and legal marketers understand how to make their marketing and business development efforts more relevant to their current and potential clients, and helps lead firms through their online digital strategy when dealing with high-stakes, visible cases. As an early adopter of digital technology, she also helps firms with blogging, podcasts and video marketing. She can be reached via email here.